This is a travertine floor that we cleaned using our pressure washing system. No restoration was done – only removal of the dingy deep down dirt that no brush or mop can reach. 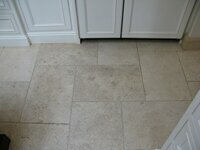 This tumbled travertine floor is cleaner than the day it was installed.